Reflexology is perhaps the most relaxing holistic therapy, effectively shutting down your body’s stress response systems, which cause a large variety of health problems. 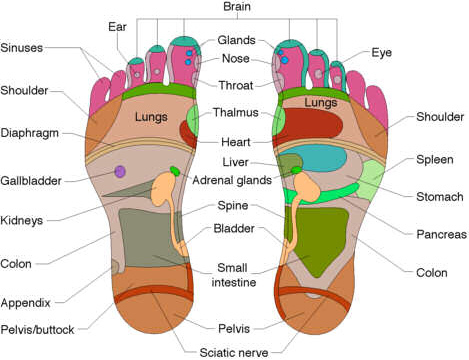 Reflexology is the therapeutic treatment of the feet to affect the entire body. It helps rebalance your various body systems and facilitates your body’s self-healing mechanisms. Reflexology has proven particularly beneficial in treating stress-related health problems (including related depression), digestive disorders, CFS, insomnia, body system problems, anxiety and ‘woman’s health problems’. Reflexology also supports a healthy pregnancy and labour. A regular reflexology treatment is a very enjoyable way to keep healthy and relaxed in our fast-paced modern world! Please note: If you are currently suffering from a verruca, fungal nail infection or athlete’s foot I am not able to treat you until it has been effectively treated. Alton Advanced Bodywork is Kipp Clark; an Advanced Clinical Massage Therapist and specialist in Chronic Pain Treatment who treats clients in Alton, Fleet, Hampshire and Surrey.